Do I have to tell you in that respect about the caring of our then two little grandchildren, which was awesome in itself? No I do not. We became aware once more how lucky my wife and I are to be the grandparents of these grand little people who find themselves at the beginning of their paths on this Earth of the beloved Mother. I would like to tell you about the following. In order to have a moment for myself every evening, I used to sit in the dark of the veranda, looking out over the valley. While smoking my little cigar and overlooking the lights of the village below, every night I was able to become silent, to meditate and to reflect on everything occurring in our lives. There were also the little lights on the slopes of the mountains on the other side of the valley. I also was able to see the moving lights of the machines preparing the ski slopes and there was the always-changing weather. Sometimes the stars were out and then Orion blazed its brilliant stars towards me and I felt very special. Sometimes it was dark and foggy and not very much could be seen. On one occasion all the lights and the stars and the mountains even seemed to have been turned off because of the fog. While the temperature was below zero that first day, for the first time in my life I was able to observe the phenomenon of frozen fog particles. I saw them forming these very small little slivers, looking silvery in the streetlamp to the left and golden in the yellow one to the right of the apartment building where we stayed. It was at that moment I re-membered what these usually unseen particles look like, every time the Angels are present! Overwhelming indeed! On another night, a bright shooting star shot by. Obviously I sent my wish along with it, and on the last night, while it was snowing heavily, a whitish fox ran across the road, less than 30 yards away. In this respect it is good to tell you that the fox happens to be my totem animal and that, way back in time and incarnations, I perhaps used to be a member of the Hopi people, my adult name being [translated] “Running Fox”. No idea though what that would be in the Hopi language. Maybe one of the readers knows a member of the Hopi and can tell me? The most profound experience though, took place on Thursday night. While meditating, I came into contact at first with Judith, my passed away daughter, and then with Magdalena, one of my Spirit Guides. We mind-talked for a while and gradually it became clear that the both of them were seated next to me on the same broad bench I was sitting. Judith on the left and Magdalena to the right of me. It seemed I could hear their breathing. We continued our talking and it became overwhelmingly clear how the Love and the Warmth and the Compassion engulfed us and it was very clear that the three of us were bathing in that Love and it was impossible for me to keep my eyes dry. Both women sat there with their arms around my shoulders and I can assure you that I felt to have been engulfed in light, love, warmth and affection. I looked up, and at that very moment I sensed this huge, more than three story-high Angel, standing in front of us! He had his enormous wings spread out and I realized that he reflected the Love we were radiating back to us, enhanced a thousand times. There were no more words left and gradually it all faded away and I seemed to be alone again. And I thanked the Angel and I thanked Judith and I thanked Magdalena, and for some time I was not able to move. I said to myself that I needed no confirmation at all of this, because the experience had been so overpowering and seemed so very real that there was not any doubt whatsoever as to all that had happened to me. Little did I know there was more to come. About a quarter of an hour later a large fluorescent cloud appeared in the gap between the two mountains in front of me. This was extraordinary in itself, because it was a dark night with no moon and only a few streetlamps in the village. The cloud expanded though, and became clearer and almost white in the dark sky. I suddenly realized that this one represented the Angel who had been with me/us, only shortly before. Then, when the cloud was at its largest, two satellites appeared out of it, unmistakably representing Magdalena and Judith. A bit later, all of it reconnected again, showing the unity, the one-ness of everything. After that, the cloud gradually became dark again and disappeared, and I was alone again with the stars. Here’s a short, fascinating talk by Doreen Virtue about angels—who they are and what they do for humans. Hans Brockhuis is a Dutch lightworker, writer and translator. His bilingual website: Running Fox Pages features spiritual work of himself and others. Working as a translator and editor, he has been and is active in processing various publications, either in English, Dutch or German. See his portfolio here. If you are interested to follow what Running Fox is offering, you may subscribe to his newsflashes. Simply send an E-mail to this address mentioning: “subscribe Running Fox’”in the subject line. What a beautiful uplifting experience and story! My younger sister of only 55 years has passed over to the other side of the eternal veils. Your story was full of hope, comfort, joy, and oneness, as we all stay connected, observation and keen senses give us many messages. Thank you very much for your thoughts about my ‘Angel’ entry at John Cali’s. Indeed it has been a wonderful, intriguing event, full of warmth and compassion. To my regret I understand from your comment that your sister, Michelle, has passed over at last. On several occasions, while you have told me some time ago, that she’d be seriously ill, I have sent some energies in her direction. But now it seems she finally lost her battle against the illness. I am very sorry to hear about that. On the other hand, and you also write about hope, comfort, joy and oneness, it is for me clear that your sister finally has become free in the sense that she no longer has to suffer from her earthly burdens. And maybe you are, from time to time, able to sort of get in touch with her, feel her and are virtually able to stroll (unphysically that is) hand in hand about the pastures of time. I wish you – and Michelle – very well Karen and once again thanks for writing me. Thank you for sharing such an awesome experience. enough strength to stay longer but she would visit again. I guess I feel her spirit in that embrace she left with me. Your blogs always encourage me. Wish you well and thank you, Margaret. The Veils, very much appreciated. Thank you so much for sharing this magical, beautiful experience with us. You’ve taken us right there with you, and as the tears stream down my face, I revel in the pure Truth, Light and Love of all. Thank you for gifting us with this story, and for showing us another example of Oneness and the Infinite love that surrounds us always. Thanks, Jenelle, for your nice words about the article. You know, when I wrote the article I had the tears streaming from my face as well. Such a thing makes you aware of the beauty of events like this. Wish you well, Jenelle. Hopefully we’ll (virtually) meet each other once again on another occasion. Love, Light and Peace to you as well. I love this. A beautiful story, Hans, and what an experience. I can see why it would stay with you. I can feel the warmth and love in just reading it. Good to hear from you again. The experience indeed was awesome, and I think back to it rather often. The Angel in question was huge. Much more so than I usually think how an angel would look like. 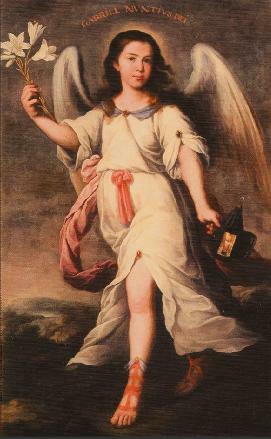 Some time ago, in collaboration with someone else, I wrote an article entitled: Gabriël, the enlighted angel. One of my grandchildren, by the way, was baptized: Gabriel. Hans – It’s good to be back and see you featured again on John’s site. I can see why the Angel Gabriel would be very important in your life after having the experience you had. It was a special moment. Indeed it was a special moment. And regarding Gabriel. This grandson is thus far the only one wearing my surname. What a beautiful experience you have shared, Hans. Thank you so much. I found it really comforting and inspiring. Blessings to you. Thank you for your kind words, Sarah D. Good to hear you found it compforting and inspiring. You are very welcome.